Kipchumba Murkomen and MP Anthony Aluoch fought at Pan Africa hotel. -Suna East Mp Junet Mohammed. - Bana Kenya News, Real African Network Tubanane. Home News Kipchumba Murkomen and MP Anthony Aluoch fought at Pan Africa hotel. -Suna East Mp Junet Mohammed. Kipchumba Murkomen and MP Anthony Aluoch fought at Pan Africa hotel. -Suna East Mp Junet Mohammed. Elgeiyo Marakwet Senator Kipchumba Murkomen has fought publicly with Mathare M.P Anthony Aluoch at Pan Africa hotel. The NASA claimed that they held the press briefing and paid the hotel. The Jubilee brigade went to Serena hotel for their briefing. NASA leaders led by Mathare MP Anthony Oluoch attempted to storm a Jubilee press conference led by Elgeyo Marakwet Senator Kipchumba Murkomen. 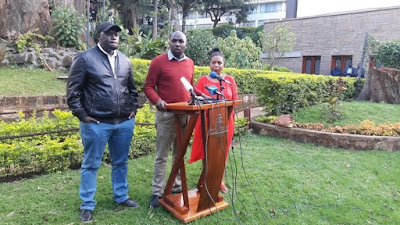 The NASA brigade accused Murkomen of disrespecting Raila Odinga during the presser as well as giving an inaccurate account on the meeting between the leaders at the hotel It was drama at a Nairobi Hotel as NASA and Jubilee leaders clashed during a live press conference in an unprecedented melee on Thursday, October 26. Mathare MP Anthony Oluoch was in the thick of the drama as he was almost mauled by security personnel at the Panafric Hotel Nairobi as he attempted to storm a press conference by Jubilee leaders. The Jubilee officials were sent out by the NASA legislators at Pan Africa Hotel following claimed jokes that irritated the opposition. The Mathare legislature said he will be ready to take out his life for the sake of Raila Odinga.